The Bush frontman and newest star of The Voice clues us in on how he sips. After melting faces at a recent benefit concert at William Hill Estate Winery in Napa Valley, the Bush frontman—and newest star of The Voice—clued us in on wine list bargain hunting, the whole warm beer in England thing and what he and wife Gwen Stefani drink on those very special nights. What wines are you drinking these days? I don’t think you can have a great meal without a glass of wine. I’m English, and I grew up around it. My dad’s really into wine. You can have lunch with very dry, cold white wines, like a crisp Sancerre. My other favorite is Bordeaux. I like beer, too. By the way, English people don’t like warm beer. People like me like Stella Artois, and we like it cold. My favorites are Pomerols, Pauillacs—Bordeaux are so smooth, and there are both cheaper and more expensive versions. I like my white wine really cold—a biting Chablis, Gavi di Gavi, Vermentino. Do you love going big on wine lists? I don’t believe you need to spend a fortune on wines. I’ve drunk 1950 Château d’Yquem and Cheval Blanc from the ’60s. It’s impressive, but it’s like drinking old art. It’s lovely when you get a restaurant where you don’t have to spend $50 to get a great bottle of wine. I like a sommelier who’ll tell you that there’s an expensive wine on one side of a hill, then you go left and there’s an unknown vineyard with the same soil and climate—someone who knows which part of the hill the wine is grown on. 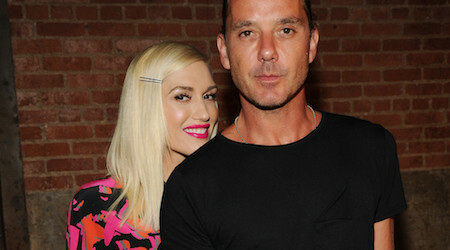 What did you and Gwen Stefani drink recently on your 12th wedding anniversary? Cervaro della Sala—the wine we had at our wedding. It’s a really oaky Chardonnay. I’d bought a bunch of it. For our anniversary dinner, it was the one we had to have. Ever thought about starting your own winery? Hell no! My wine knowledge is like my knowledge about everything—it’s pitted.